Why are signals broadened in polarography? 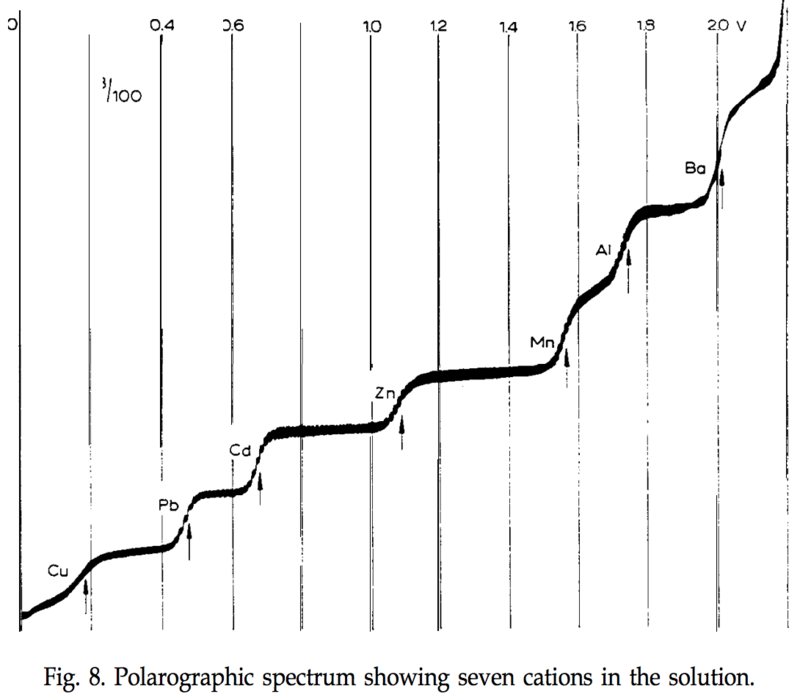 In the attached polarogram from Heyvrovsky's 1959 Nobel lecture, transitions from one plateau to the next are smoothened out rather than sharp and abrupt. Why is that? I understand that currents were small in this experiment, so metal ion concentrations should not change significantly. I would have expected the current to jump from one level to the next as soon as the necessary voltage is reached. What broadens these transitions? Browse other questions tagged inorganic-chemistry electrochemistry analytical-chemistry or ask your own question. Why is current non-zero when applied potential is still below E$^0$ in cyclic voltammetry? During electrolysis, why are the products attracted to the cathode? How can I make a fairly saturated copper (II) sulfate solution by heating? Why are many chemical relationships logarithmic? Is it possible create crystalline solvate of electrons? How to Prepare a Buffer Solution? Why are HCl fumes white? Why are acetylene and air commonly used for AAS? What is number of 1H NMR signals for toluene?